Photo right: The sidewalks at the open-air chapel leads to the gravesite of Gulfside founder, Robert E. Jones. At the end of February, the board of directors of the Gulfside Association of The United Methodist Church, Inc. will dedicate the new open-air chapel at Gulfside Assembly located in Waveland, Miss. The chapel is named after Bishop Leontine T.C. Kelly, the first African-American woman to become a bishop in The United Methodist Church. It is the first structure since Hurricane Katrina wiped out every building on the Gulfside Assembly grounds in 2005. Gulfside Assembly was founded in 1923 by Robert E. Jones, the first Black Methodist Bishop. It was the only place that African Americans and their friends could meet for spiritual retreats, educational and recreational activities. Gulfside Assembly is recognized by The United Methodist Church and the State of Mississippi as a historical site. The celebration of the Bishop Leontine T.C. 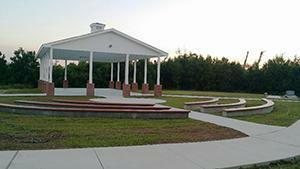 Kelly Open-air Chapel will be Saturday Feb. 27, 10 a.m., at 950 South Beach Blvd. in Waveland, Mississippi. Resident bishop of the Mississippi Area, James Swanson Sr. will be present for the ceremony. He serves on the board of directors. The public is invited to attend. Mollie Stewart, president and CEO of Gulfside Assembly stated that she is excited that there will now be place to gather on the campus without needing a tent. However, there is still a long way to go to restore Gulfside. She is prayerful all United Methodists will offer their full support for Gulfside. The cost to build the chapel was more than $100,000. Gulfside is under the care of the Southeastern Jurisdiction of The United Methodist Church and is located in the Mississippi Conference.